How do I configure my Electa Live account to accept payments from students? Can I accept payments for live classes and online courses into my PayPal account? Can I accept credit card or debit card payments? How do I accept bank transfers for my paid classes and courses? With Electa Live you can schedule paid online courses and live classes. Students can pay for your online courses using PayPal, Credit/Debit card, bank transfer / wire transfer and check payments. 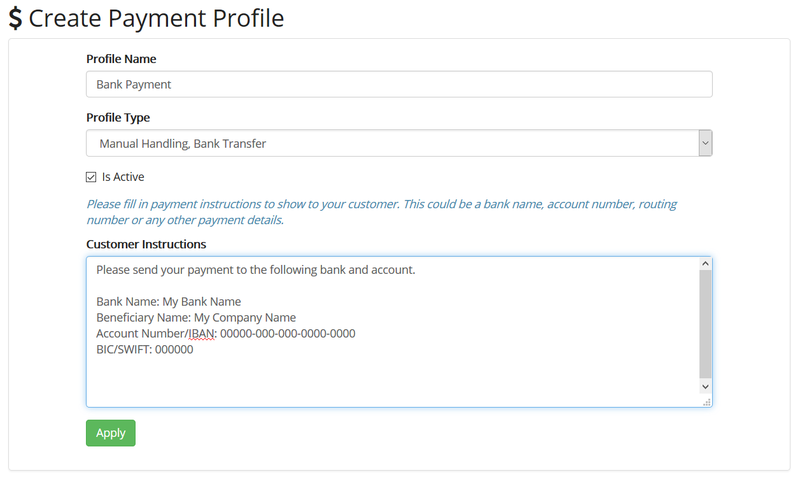 To accept payments from your students and customers you need to configure at least one active payment profile. Payment profiles define how you can collect your money. The payment profiles are accessible from the main menu of your LMS - Account Settings > Payment Profiles. For each payment profile that you create you need to have an account with the respective payment gateway. For instance - to accept payments into a PayPal account you need to have a business PayPal account. For accepting credit/debit card payments at the moment we support Stripe (www.stripe.com), 2CheckOut (www.2checkout.com) and BrainTree (www.braintreepayments.com). To configure a credit card account through Stripe, 2checkout.com or BrainTree, please sign up on the respective website and use the API values and keys as explained below. The following payment options for accepting payments from students are supported at the moment: payment by bank/wire transfer or check, automatic PayPal payment, automatic credit and debit card*. To be able to accept checks or payments by bank you need to create at least one active payment profile of type Manual Handling. Fill in your bank account denials and other instructions that may be needed for the payment. This will be displayed to your customer should they select to pay by bank transfer or check. To accept payments into a PayPal account you need to configure a payment profile of type PayPal. This has to be a merchant PayPal account. Please make sure to specify the correct email address of your PayPal profile as this is where the money will go. To accept credit or debit card payments you need to create an active profile of type Credit Card - 2CheckOut, Credit Card - BrainTree or Credit Card - Stripe. Currently these three payment processors are supported so you need to have an account with one of these and configure the correct API credentials. Please refer to the API options of the respective card processing service to obtain the necessary private and public keys and a vendor/merchant ID.